Facebook army games have up until this point been rough text-based RPG games but this changes with the impressive Arrmy Attack game from Facebook game developer Digital Chocolate. In this game, you have a large map with various sections to uncover but you must defeat your enemy first. You’ll start with just a few troops but by placing buildings, defenses, and liberating cities you’ll soon have a vast army to defeat your opponent. During game play, you can call in supply drops to heal your troops or repair defensive structures. Facebook friends can visit you and help with the war effort by attack enemy troops or healing your own. The game features various troop types such as infantry soldiers, tanks and other vehicles. Take quests in the game for rewards and collect special items. In Army Attack, you use energy points to move your troops across tiles on the game map. You’ll encounter tiles blocked with enemy obstacles such as mines, defensive barriers, towers or enemy troops. If you have more than one free unit you can surround the enemy and increase your firepower to destroy it. As you destroy units or defenses, you’ll receive cash and items. 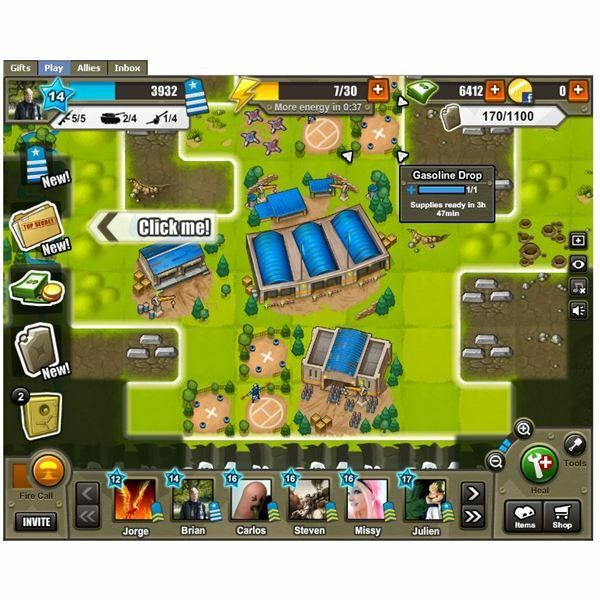 The game features various structures to help your war effort such as storage areas, headquarters, and other buildings. These structures require parts, which you can acquire from destroying other units or by getting the part from Facebook friends. Buildings help increase your overall troop limits giving you more firepower to work with. Another part of the game is the use of supplies to heal damaged units. To increase your supply levels you’ll need supply drops, which will bring you more supplies over time. Buildings are also another source of supplies and you’ll receive some from each building. Moving units and attacking requires energy points and Facebook friends can send you more or you can buy them with credits in the store. Over time, you’ll slowly gain your energy points back. The game features various quests you can take for rewards and the quests have a story to them. You fight different enemy generals on the map by unlocking the area. The game features various collection items and when you have enough of a certain item, you can perform special bombing moves against enemy targets called a fire call. These moves are helpful if enemies surround you. Army attack also gives you different defenses to slow your enemy down. You can use wire, mines, scout towers, bunkers, and other defense structures. As you take tiles they will turn green and you can see more of the map. Other areas of the map are covered in clouds with the typical "fog of war" feel. To enjoy this game to its full potential you’ll need some Facebook friends to help you. Completing structures in the game require many different parts, which you can get easily from Facebook friends. Your friends can also visit you and help with the war effort. Friends can heal your damaged units, collect your supplies for you, and do a bombing run on nearby enemy units. Visiting friends also brings you extra energy points and special ally reports you need for the fire call mission. The game looks great with a war torn battlefield and various battle sounds. The game also has a nice soundtrack. Army Attack loads well but sometimes has errors, which forces you to restart the game. Since the game is new, these errors should decrease over time. 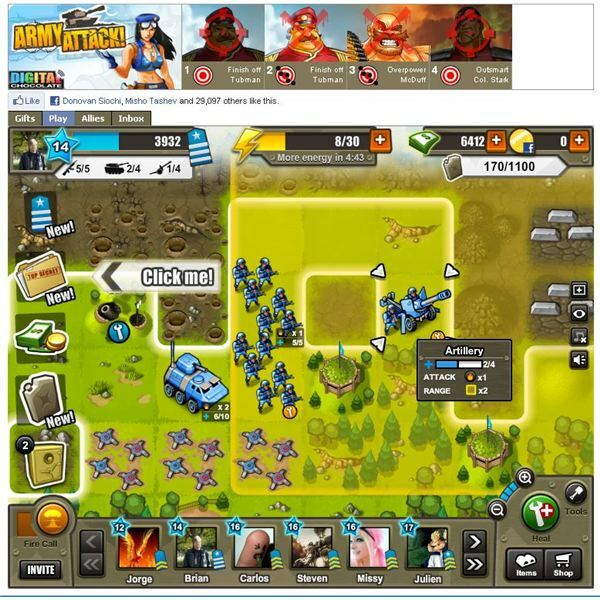 Army Attack is a nice Facebook game but the main problem it faces is that it's too easy to play. In just a few days mos tof the map is uncovered with just a few troops. the supply drops make it easy to heal your units and move them quickly around the map. The game either needs more maps or harder difficulty. Despite the supply drops and ease of healing your units, the game is still fun to play. This game is a nice addition to gaming on Facebook. All images from Army Attack. Source: Article is author's own experiences playing Army Attack on Facebook.